I so much love God’s sovereignty; I literally come alive when I read scriptures that display the awesome sovereign power of our God. I feel so proud and makes me go on the side… Oooh yeah “That is my God”. “Kwame, I’m God, you’re a man; I’m smart, you’re dumb; I’m big, you are small; I’m right and you’re wrong; and there’s nothing you can do about it….hmmm, OK not really like that; this is just a line I stole from Roald Dahl novel, Matilda. However, that’s how I feel whenever God pulls his sovereignty on me. I kind of feel like how Job felt when he called God to the ‘witness stand’ to answer for Himself concerning His justice. After God showed up; Job went “Oops! I’m an idiot God, I spoke too quickly; I spoke of things I had no idea about”. Putting all of these together, we can be certain that God knew exactly what He was doing when He created man. He knew everything that was going to happened when He put the tree in the garden; when he allowed the devil into the garden; yes the devil was allowed into the garden; he did not slip his way through the back door. 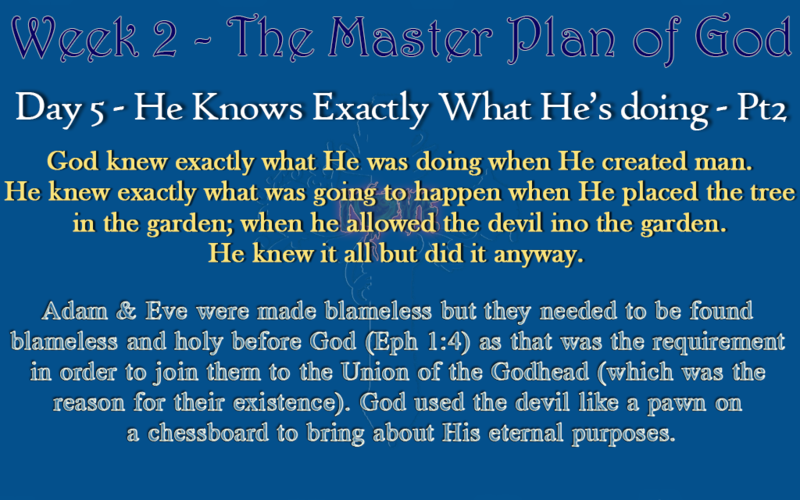 In fact, the mystery to how and what the devil was doing in the garden is revealed in Job 1 & 2. The same tactics the devil used with God concerning Job was the same one he used concerning Adam. But unbeknown to the devil was that he only played into the hands of God’s eternal plan and purposes. Adam & Eve were not destined to fall; it wasn’t their fate to disobey. They willingly chose to disobey; just as Job chose not to curse God and Jesus chose to obey God when they were tempted. Adam & Eve were made blameless but they needed to be found blameless and holy before God as that was the requirement in order to join them to the Union of the Godhead (which was the reason for their existence). God used the devil like a pawn on a chessboard to bring about His eternal purposes. Don’t get me wrong there are many things God never desired or intended happened, such as He never intended Adam to hand over the control of the earth to the devil through his disobedience. Therefore, the consequences of the choices man makes are real and they do cause things that God never intended to happened. However, God’s master-plan is so grand that it accommodates every form of disobedience that humans will make and every evil scheme that devil will plan. For this reason all the plans from the evil one will only end up to bring about the purposes of God within His master plan and so is the good, the bad and the ugly things caused by our (man) choices. So Solomon was right in saying…nobody can take or add to the plans of God and why Paul said of you (as a follower of Christ) that “All things will work out for the good of you because you’re God’s”. Today as you think and meditate on this, know that your weaknesses, mistakes, failures or struggles are not final. God can and will use them for the good of His purposes. If God was able to use the devil’s greatest victory to bring about His good and eternal purposes; then there’s nothing the devil can throw at you or hold on you that God cannot use for His good. You were destined for victory no matter what your current struggles look like. This is the Sovereign work of God on your behalf.